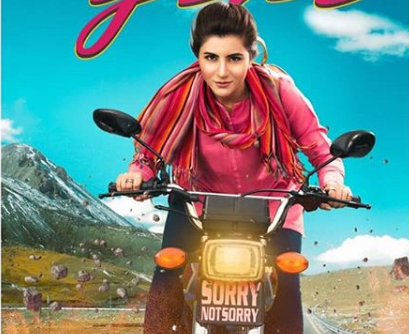 LAHORE: The first look of Pakistani actress Sohai Ali Abro’s upcoming film Motorcycle Girl based on the life of Pakistani motorcyclist Zenith Irfan has been revealed. Taking to social media, both the lead actor and director of the film, as well as the inspiration behind the film, Zenith Irfan, shared the poster for the film which is vibrant, fun and quirky. The poster shows Abro, with a half smile on her face, on a motorbike which has a number plate reading “Sorry not sorry.” The mountains can be seen in the backdrop. Zenith Irfan was the first woman to undertake a solo journey across the country’s north “where it’s taboo for women to venture out unaccompanied, let alone riding solo on two wheels.” Her daring adventures, documented via Facebook on her blog as 1 Girl, 2 Wheels, have received tremendous appreciation from the public. To prepare for her role, Sohai also learnt how to ride a motorcycle and was reportedly making the same journey from Lahore to the breathtaking Khunjarab Pass that Zenith undertook in 2015. Motorcycle Girl is slated to release on April 20, 2018 and also starres Samina Peerzada, Sarmad Khoosat and Ali Kazmi of Baaghi fame.